I don’t know if it’s because it’s been extra cold here this Winter or because I’m almost fully recovered from my surgery but I am so thankful for Spring. Spring has always represented a new beginning and I’m craving it more than ever this year. You know what’s even better? 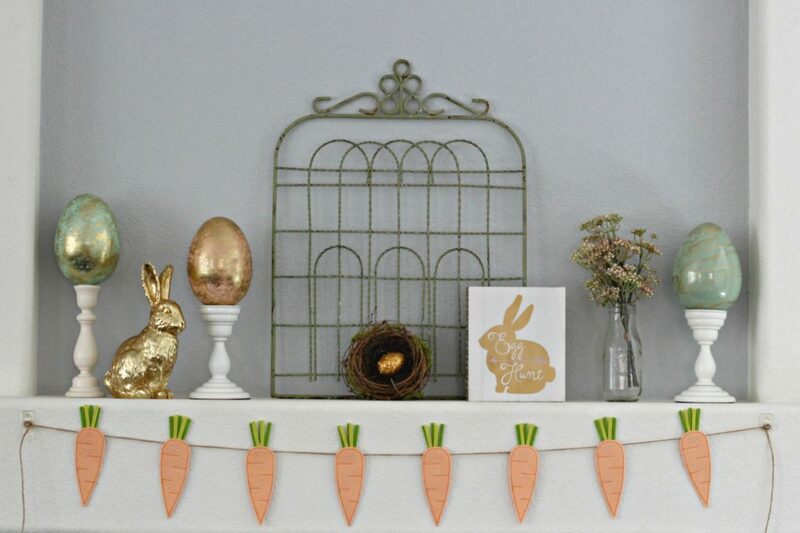 I already had everything except the banner to create this beautiful Easter mantel display. Not bad for $3! 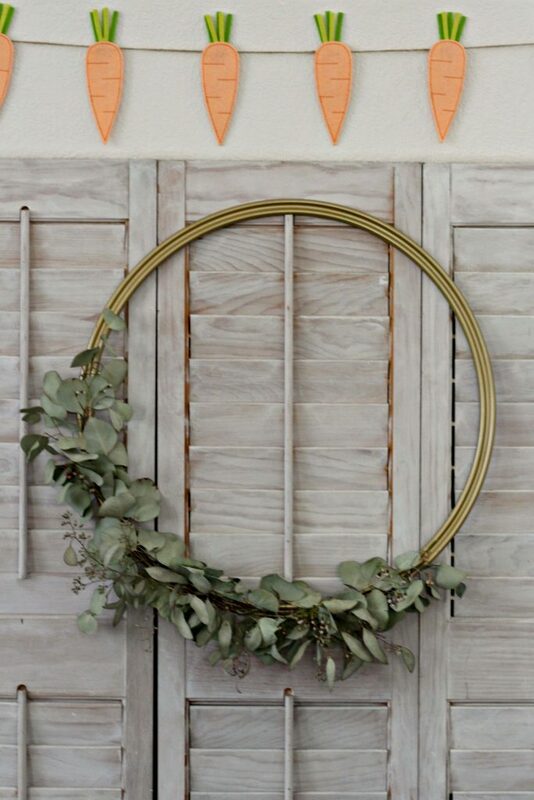 This hoop was found at a hardware store and spray painted gold. 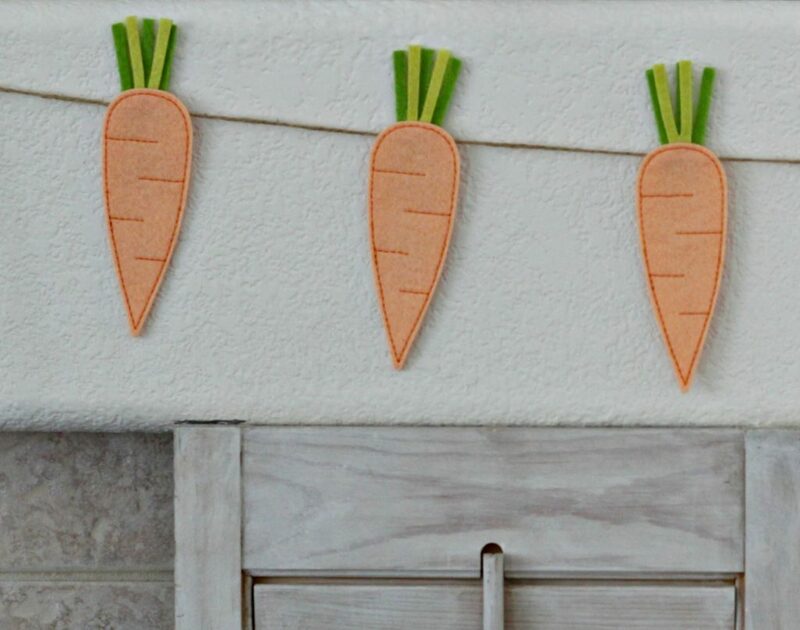 You can wire on any flowers or greenery that you like. Eucalyptus is a beautiful choice for Spring. 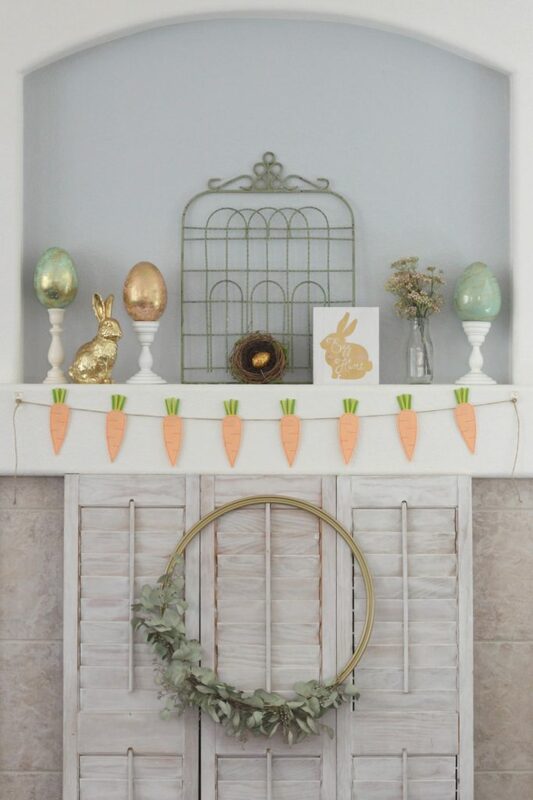 The soft green goes perfectly with the rest of the mantel decor. It makes a big statement on the shutters in front of the fireplace so I didn’t add anything to the hearth. This is the only new item I purchased this year. I found it in the dollar area at Target for $3. Orange is my least favorite color but because it’s more of a peach tone I’m okay with it. 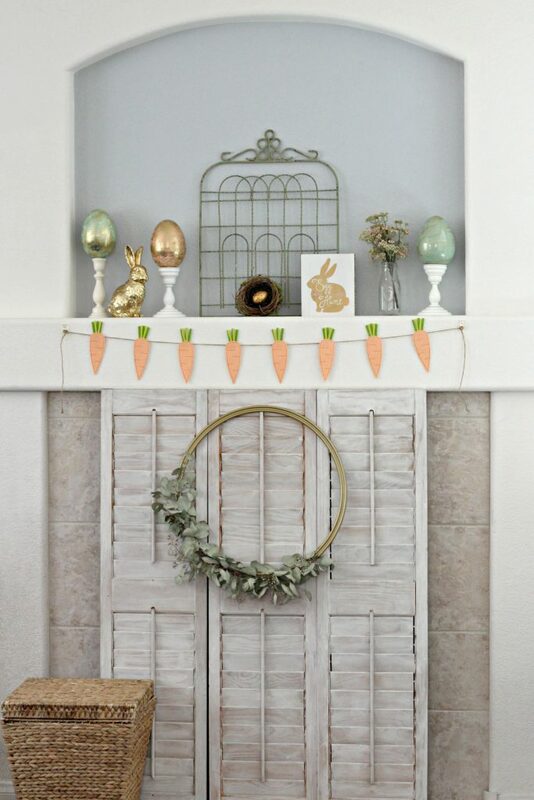 I think it’s darling and it goes really well with the garden gate and bunny theme. These large marbled eggs are actually made from styrofoam. I bought them several years ago on clearance. The small candle holder is from Ikea and the tall one is from Michael’s. It was raw wood and I painted it white. 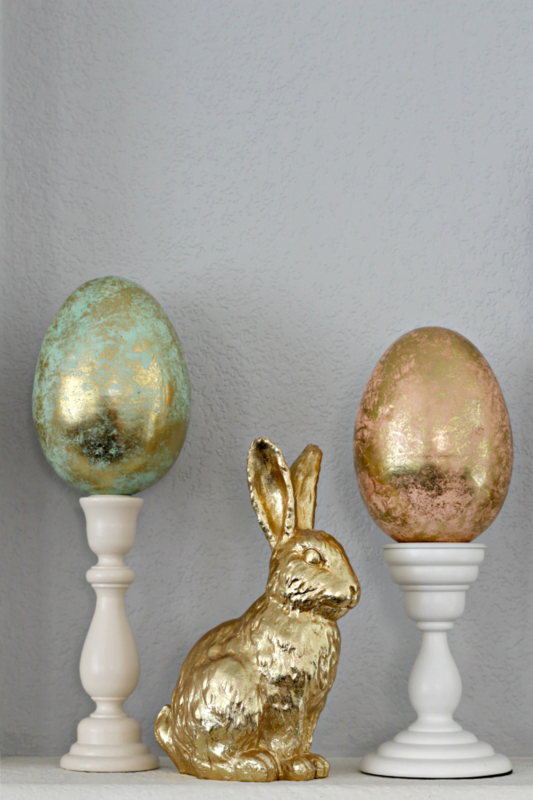 The golden bunny was bought a couple years ago from Home Goods. I think it jumped in my cart while I was shopping! 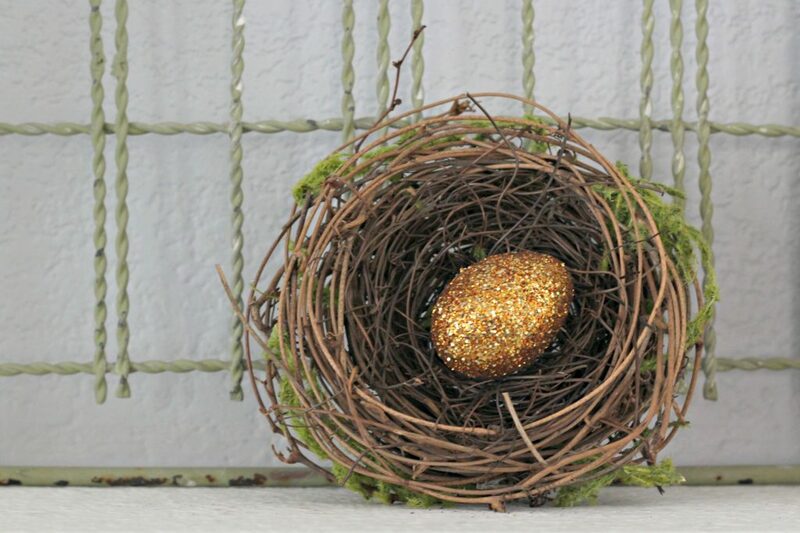 I made about 6 glitter eggs several years ago. They turned out so cute that I think it’s time I make a few more. I almost got rid of the garden gate during my last home declutter but remembered Spring was coming up and I just couldn’t do it. I’m glad I kept it. 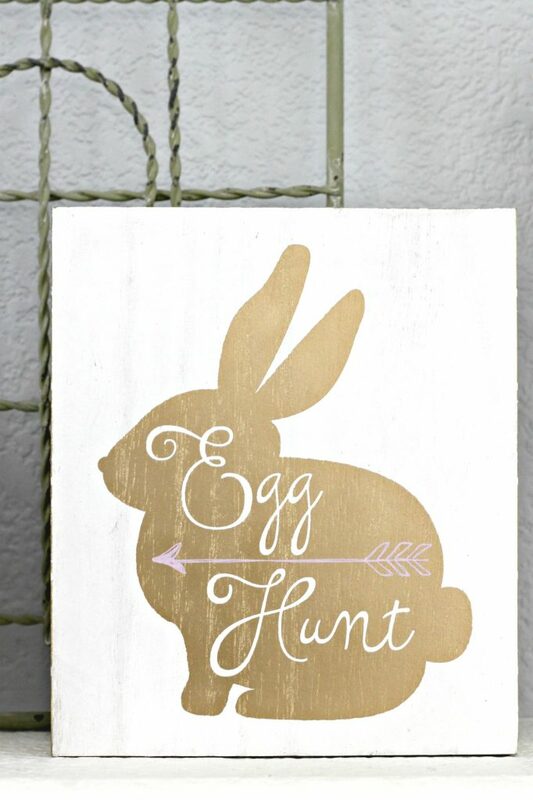 The egg hunt sign was from Target a couple years ago. It looks more brown in this picture but it’s actually gold. 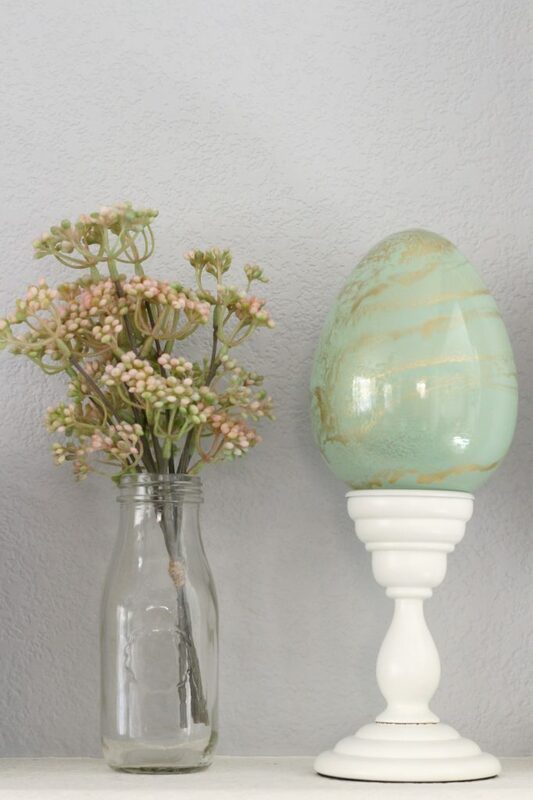 This marbled egg is made of glass and was a great find at Home Goods a few years ago. The flowers and bottle are from Target. I can’t tell you how rewarding it is to me to make a space beautiful with things I already have. I enjoy making a welcoming and comfortable home for my family and friends. I hope by sharing some of my ideas you can get inspiration for your own home.